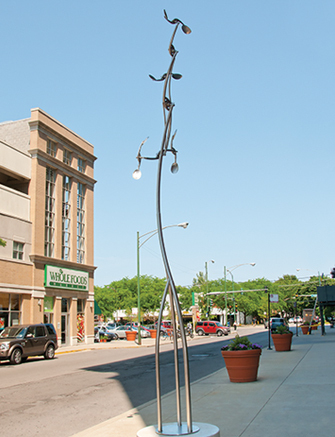 Old School is a wind-activated kinetic sculpture that functions like a weather vane. 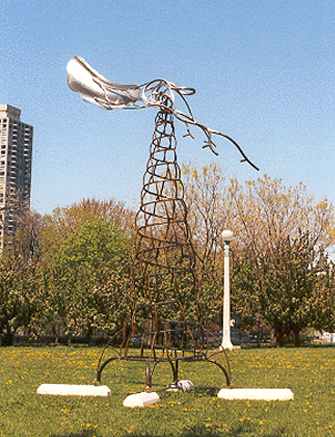 It has three individual moving elements which are inter-connected to form the kinetic portion of the sculpture. The piece is anthropomorphic, both in design and motion, resembling a creature or multiple creatures swimming or flying through space. 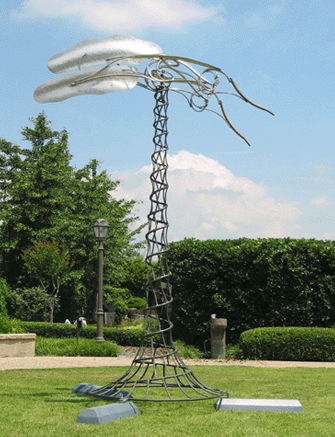 The 12-foot sculpture is made of stainless steel, aluminum and mild steel. Lewis received a BFA from the School of the Art Institute of Chicago. His sculptures have been commissioned for Australia’s Expo ’88, Northern Illinois University and Warner Brothers’ "Twister" movie. In the Chicago area, his work has been featured at Pier Walk, Evanston Art Center and Klein Art Works. Lewis’ kinetic sculptures are constructed with the intention of being powered by wind. Their unpredictable motion gives them a dynamic motion, changing each instant and following no set pattern.